The 486th Bomber Group was only here from April 1944 to August 1945. However in that short time 33 aircraft were lost in raids over Europe and another 23 in training and other accidents. 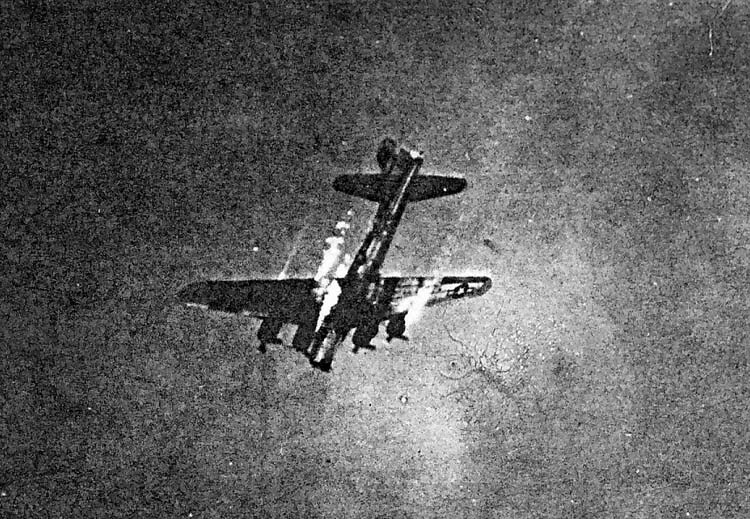 Recent research indicates that some 207 airmen died – the terrible human cost of the bomber offensive. Training flights continued into May- on May 1st 14 Liberators flew off to Orford Ness to practise their bombing skills. However, bad weather over the Continent delayed the start of combat missions. On May 7th the weather cleared and 19 aircraft went on their first mission over Occupied Europe, returning with all planes intact apart from minor flak damage. Over the next 10 months, until April 21st 1945, the 486th Bomb Group flew 188 missions into Occupied Europe, targeting gun batteries, oil storage facilities, train marshalling yards, factories and chemical works as well as V-1 launch sites and a V-2 production plant. Many of the airmen at Station 174 were very young, averaging about 22 years. Despite all the training nothing could have prepared them for the stresses, hardships and dangers that they now faced. The environment of the B-24 Liberators, and the B-17 Fortresses they flew from July 1944, was freezing, vibrating, uncomfortable and also unpressurised so crew members sat in their positions encumbered by thick layers of clothing, body armour and an oxygen mask. Heated flying suits improved comfort but made movement even more difficult if it came to baling out of a stricken plane. Some positions in the planes were also extremely isolated, the rear gunner’s for example, and the intercom contact with other crew might well be cut by flak damage. On top of all this there were now the dangers inherent in air war. 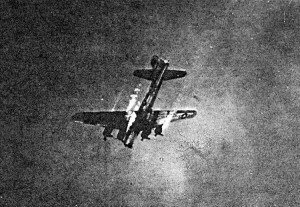 In May 1944 the 8th Air Force was experiencing heavy losses and there was no more than a 36% chance of a man completing a full tour of duty of 25 missions. The dangers began on take off, when planes set off down the runway with a full load of bombs and fuel. Some failed to gain height and crashed on take off. Once in the air large numbers of planes from different local bases were climbing to take up and then maintain close formations; these gave mutual protection but brought a real risk of mid-air collision. Over enemy territory the main threat came from enemy fighters and the explosions of anti aircraft ‘flak’ shells which propelled thousands of steel fragments scything into men and machines. Some aircraft went down in flames and all on board perished; in others the crew took their chances and bailed out. A damaged plane would lose the protection of the formation but the pilot might still try to head for home, with the plane limping back eventually to ditch in the Channel or crash land when it finally crossed the English coast. These young men could rely on ties of comradeship and close team work but they all knew that in the end whether they lived or died was largely decided by Lady Luck. May 20 1944. Heavily laden Liberators rumbled down the runway in heavy fog. Suddenly heavy explosions were felt by the crews still awaiting takeoff and a red glow was seen beyond the end of the runway. In the poor visibility two aircraft No 726 (pilot Norman Sturgeon) and 691 (Fred Hendricks) had clipped trees on take off and crashed. 10 men died, 11 survived. The rest of the force took off successfully but returned without dropping any bombs due to heavy cloud over the targets. May 28 1944. Attack on an oil plant at Lutzendorf deep in Eastern Germany. B-24 No 764 was hit by flak. ‘Our plane lost the first engine…then the second, then another. As we lost engines we could not hold altitude.We believed that a crash landing would not result in the survival of many of our crew. We decided that to bail out two by two over a wide area would improve the chances for all of us.’ So it proved. Five of the crew were captured and ended the War in POW camps but the remaining five fell into the hands of the Belgian Resistance and were hidden until the Liberation forces overran their hiding places in 1945. September 5 1944. 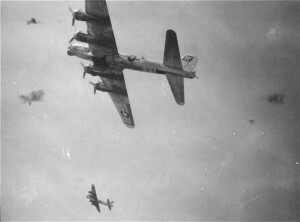 B-17s were on a mission over Brest. The crew of No 875 were having problems closing their bomb doors and for some reason the pilot A Eachen did not follow the rest of the formation in a crucial turn, resulting in a collision with No 949 (pilot T Crawford). 875 flew apart on impact with part of the left wing, one engine and the tail section breaking off. The collision cut off the tail section of No 949 and the fragments of both aircraft spun down to the ground. 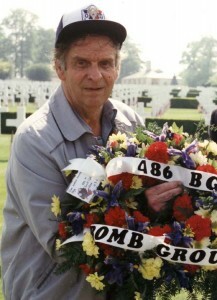 Officially both crews were listed ‘ Missing in Action’ and their names are recorded on the Wall of the Missing in the American Military Cemetery at Madingley. October 15th 1944. The No 4 engine of B-17 No 137 (pilot Clarence Herrmann) failed to deliver full power on take off and the plane crashed onto Woodhall. 15-year old Raymond Smith, sleeping upstairs, was killed along with all the B-17 crew except the pilot who spent the rest of his life an invalid. He died in 1976, the same year that one of the propellers of his plane was found in the dried up moat of Woodhall. 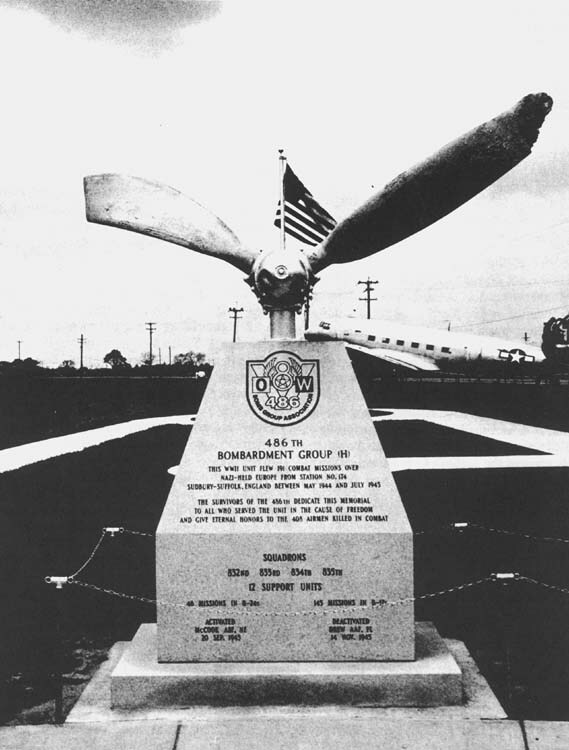 It now sits atop the 486th memorial at Barksdale airbase, Louisiana. All the airmen who flew with the 486th from Station 174 knew the dangers they faced and some admitted to moments of great fear ‘ I was really scared on this mission. When you’re in flak you think every burst has your name on it.’ Despite this, they were able to face up to those fears and still operate coolly and effectively.<The 486th lost a total of 56 aircraft whilst in Sudbury, 33 of them in action. 207 men died, 77 were wounded in action and 303 were captured and became POWs. Everybody living in Sudbury and the nearby villages was aware of the American presence. The airspace above the town was a major assembly point for planes from different local airfields prior to setting out on their missions, ‘one might see a score, fifty or a hundred planes circling.’ The roar of the engines at Station 174 could be clearly heard down in the town and local people gathered to watch the bombers depart and assembled again to await their return, watching for the red flare that meant ‘wounded aboard’. Local children were drawn irresistibly to the base, to admire the aircraft, look for souvenirs on the dump-one child even brought home a machine gun – or hoping for a gift of chocolate or chewing gum. 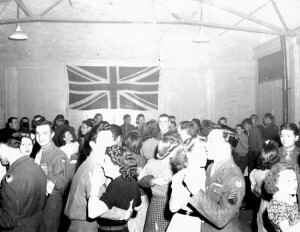 The base provided a range of social activities but many airmen sought R &R in the town, taking the ‘Liberty Bus’ down about 6.45pm and returning at 10 or 11pm. Most men spent part of the evening at the Red Cross Club in East Street where the food was cheap. Some went to the Gainsborough or the County cinemas although they might well have seen the film already back home. Others frequented the local pubs or went to the regular dances at the Victoria Hall. However, generally relations between the townspeople and the men from the base were extremely cordial. Some local women in Great Waldingfield took in the airmen’s washing and welcomed them into their home. 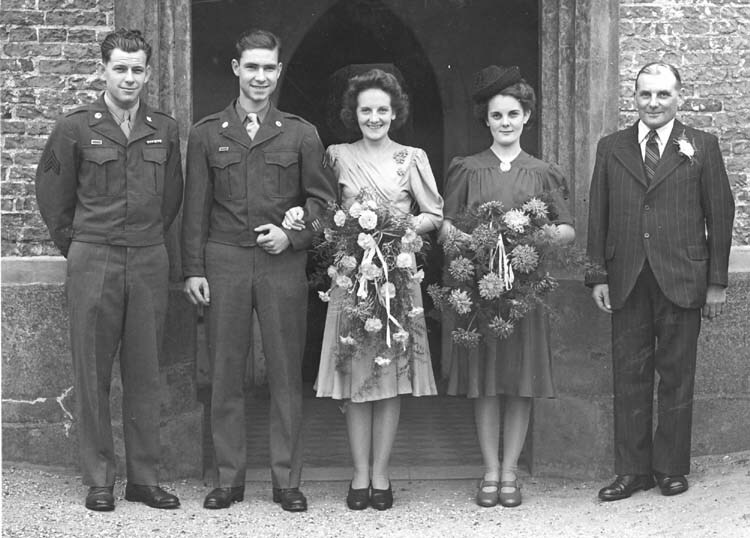 A number of local girls married American servicemen like Joyce Crosby of Church Road Great Cornard who met G.I. Cliff Knight at the County Cinema, married him in Great Cornard Church and sailed off on the Queen Mary in 1945 to join him in Baltimore. Many other transatlantic friendships were forged in that momentous year 1944-45 and renewed when the 486 Veterans have returned to Sudbury.